In this blogger's world there are the chosen ones. A musical Premiership of sorts. Regular readers will know who they are. 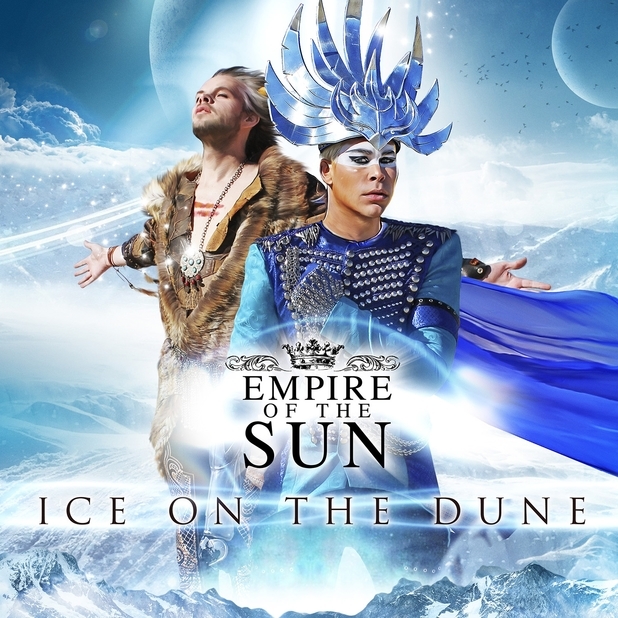 But if you don't know and/or need reminding, the creative Aussie duo Empire of the Sun figure in that very exclusive list. So you won't be surprised to learn that "Ice On The Dune" was probably my most eagerly awaited CD of 2013 and I bought it immediately on its release. The big question is, does it measure up to its mighty predecessor, "Walking On A Dream"? Well, yes, and no. For "Walking..." was a great debut but also for me a patchy one, as I don't always play it from beginning to end. Yet the greatness of the first four tracks on that album (and "Without You" in its remixed form) totally outweighs most of the recorded output by everyone else from that time and, well, ever since then. At that time they were compared to MGMT - an unfair comparison in my view, as EotS are (a) way better and (b) have their own unique sound and identity. Add to that the unique back story of the duo's 'characters' ("Emperor" Steele and "Lord" Littlemore) and the fact that the divine Nick Littlemore does not take part in the band's live touring schedule, leaving main man Luke Steele and his backing band to do the honours, which just adds to the duo's intrigue. "Lux" is the album's opener. Fans will remember this as the opening number from the album launch gig at Sydney Opera House, which was streamed online. It sets the scene for "DNA" which is one of the most instant and commercial sounding tracks, and very close in sound and spirit to the best tracks on "Walking On A Dream" so it's no surprise that this will be the second single to be released from this album. It's catchy, distinctive and stands up to repeated listening. "Alive" is next in the track listing: released as the first single, it screamed "summer anthem" with its happy and positive vibe, yet (in the UK at least) was totally overlooked. I still don't understand why the UK doesn't 'get' EotS although that's probably more to do with the emphasis on EDM and trashy grime/r'n'b/talent show acts in the charts and on the radio, and anything outwith that seems to be overlooked. "Concert Pitch" and title track "Ice On The Dune" follow, both maintaining the same recognisable vibe from the first album. "Awakening" slows the pace down but is one of the album's real growers: this sounds like the Pet Shop Boys doing a variation on the Beloved's "Sweet Harmony". Yes, that good. It took me a while to get into "I'll Be Around" but it was eventually very rewarding. Again, there's a little PSB influence here. If you cast your mind back to earlier in the year, there was a little taster-video posted on YouTube for a song which we all thought was called "Discovery" but it's actually called "Old Flavours" This was the song which followed "Lux" in the Sydney Opera House gig. 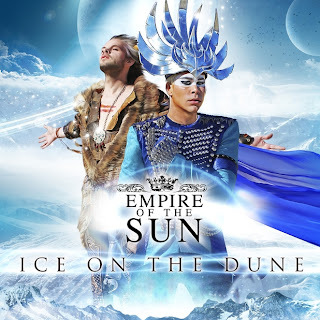 It's mainly an instrumental, which I'm not usually a fan of, but this is packed with greatness and again reminds me why I love Empire of the Sun so much. The album ends with "Keep A Watch" which like "Without You" on the debut album will probably benefit from a dance remix in the future. They are promising a UK tour at some point. One thing's for sure, I will "keep a watch" as that's one band I would love to see play live in my part of the world. "Ice On The Dune" still makes me happy and proud to call myself an Empyrean. Although this album, like its predecessor, may not be 100% perfect from beginning to end, it has totally enriched 2013's musical landscape and was well worth the wait. Back again after a few weeks off blogging and tweeting. Unfortunately it was impossible to give up the internet though, the way I did last August. Oh well, maybe some other time! 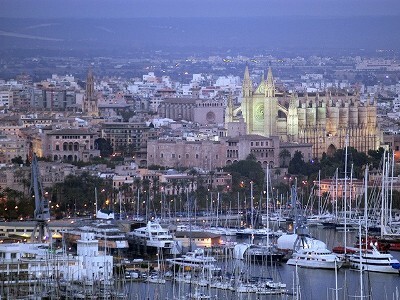 ...we're heading off to the city of Palma de Mallorca! We'll be there later in September for a short city break and are looking forward to it. Mallorca, Majorca, call it what you want, has always been a very popular holiday destination over the years but we've never been there. Most people who fly to Palma then get on the transfer bus to many of the island's resorts and totally miss out on the delights of the city, apart from maybe a day trip there. I first became interested in the city whilst researching cruise itineraries last year. Whilst we were looking at options for a city break, Palma unexpectedly came into the equation and seemed just right for what we were looking for. It will be our first trip to Spain since our spring trip to Barcelona in 2004. Palma looks like a miniature Barcelona in many ways: an architectural feast for the eyes, lots to do, see and explore, and of course the big highlight of our holiday as always will be enjoying the local food and drink :) Time and loads of other stuff permitting, The Palma Diaries will be posted on here around the end of September, with all the usual gratuitous food photography and scenic views.